60th Kerala School Kalolsavam 2019-2020 will be held at Kasaragod. 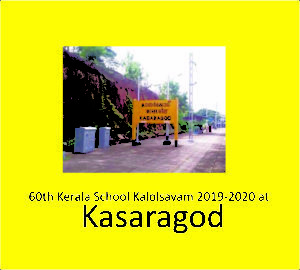 60th Kerala School Kalolsavam 2019-2020 will be held at Kasaragod, known as the land of Gods. Palakkad won the overall championship in Kerala School Kalolsavam 2018-19 held at Alappuzha. Second place- Kozhikkode, Third Place- Thrissur. It is an annuval event conducted by the Educational Department, Govt.of Kerala. Schools all over Kerala will participate the event. The participants are students from classes 8th to 12th standards. This event will be usually conducted in the month January of every year. The first School Kalolsavam held at 1957 in Ernakulam district, the industrial capital of Kerala state. From then the numbers of participants increase in a huge manner year after year. The decorated main stage is an attraction in this festival. Every year lakhs of people come to the festival for enjoying the young talents from across Kerala. After the 7 days of mela winners will get an ever rolling trophy of 117.5 sovereign gold. Chirayankeezhu Srikandan Nair, Art Instructor in Education Department was designed the the Gold Cup. The competitions include Bharathanatyam, Mohiniyattam, kathakali, Oppana, Folk dance, Group dance, Instrumental Music, Light music, Fancy Dress, Kerala nadanam, Yakshaganam, Ottan thullal, Nadan pattu, Kathaprasangam, Daff muttu, Arabana muttu, Kolkali, Band melam, Painting, Drawing , Clay modeling, Essay writing, Poem writing, Story writing, Poster designing etc.